For your information, there will be two babywearing talks in the coming weeks, both by our PR Officer, Adriana. These informative talks will introduce you to the basics of babywearing: the benefits of babywearing, the types of carriers available and there will even be demonstrations on how to use the different carriers. Whether you are an expectant parent, a mom or dad curious about babywearing, or a even a babywearing veteran, your presence is more than welcome. Yay! Malaysian Babywearers finally held its first KL Gathering of 2010 just lastweek on 17th April 2010 (Saturday)! Many thanks to Mom's Little Ones for their generous offer to let us use their cosy space to host the gathering. The gathering started at around 3.00pm. About 30 parents showed up with their children; some were newbies who came to learn more about babywearing, while others were experienced babywearers who came to give their support and learn more about other babywearing techniques. The topic for the gathering was Introduction To Babywearing, which was then immediately followed by demo sessions of the various carriers. Everybody took the chance to try out the different types of carriers. It was such a wonderful sight to see all experienced babywearers showing the newbies how to wear their babies in the various carriers. And let the wearing begin! An experienced babywearing mama showing a newbie how to wear her baby in a wrap. Another experienced babywearing mama showing another mama how to wear her baby in a mei tai. Babywearing daddies were also there to give their support to the babywearing mamas. A group picture at the end of the gathering. Thank you to everyone who came to the gathering. We look forward to our May 2010 KL Gathering! Sad? If you consider what one can get out of babywearing... bonding, attachment, love... you will ask yourself this question: How can babywearing be sad? Oh no, if you have been reading about the Safety Warning, no, this is not what it is... That, of course, is sad and heart-breaking, too. So, do have a read if you haven't and learn more about the precautions you shall be observing while babywearing. 2... You try your best to show one the benefits of babywearing (and, even breastfeeding) only to be shunned and given the negative look as though you are trying to pass them a disease! Have you got anything 'sad' to share in babywearing? 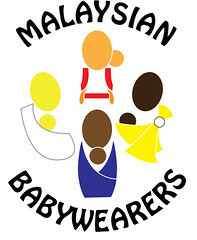 On Sunday, 28 March 2010 , Malaysian Babywearer's Public Relations officer, Adriana, was on TV to promote babywearing! Please click here to see a video of her interview (thanks, Hidayah, for uploading it!). Thank you to Nasi Lemak Kopi O for helping us in our mission to promote babywearing to Malaysians!